Bodham House01263 715779work01603 870304fax Self-cateringA former Victorian Rectory, Bodham House is a wonderful, spacious holiday home that will suit families or friends and is the perfect spot for a celebration or special occasion weekend away. 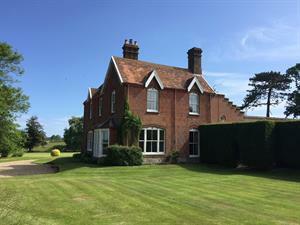 The house is surrounded by wonderful countryside views and there is 1.5 acres for everyone to let off steam. Dogs are welcome too and there are some lovely walks directly from the property, one of which will lead you back to the village where there is a good pub and a fishing lake. This is house for all seasons and a welcome awaits at any time of the year. The house is located just a short drive from the coast where you will find lovely beaches at Cromer, Weybourne or Sheringham for family days' out. History buffs will enjoy visiting Felbrigg House Estate and there are beautiful views from nearby Sheringham Park down to the coast; you may even spot the local coastline steam train. In land take a trip to the elegant Georgian town of Holt for a days browsing in the boutique fashion shops, art and antique galleries. Amazona Zoo is near to Cromer and the clifftop walks at Cromer itself showcase beautiful views of the coast. There is plenty to do in the area. • Pets: Two dogs welcome, please be aware of our booking information regarding pets. • General: E.C.H, Electric convection heaters, Woodburners, Open fires, Wood starter pack supplied. • Other: Towels. Travel cot, Books and games provided. Welcome Pack. • Outdoors: Garden of 1.5 acres. Table & Chairs. Barbecue. Grass tennis court available from June - September. • Notes: Please request the truckle bed (if required) and either the super king or twin beds (as required) on booking. • Deposit: There is a refundable £750 good housekeeping deposit payable 56 days prior to the start date of the holiday. A former Victorian Rectory, Bodham House is a wonderful, spacious holiday home that will suit families or friends and is the perfect spot for a celebration or special occasion weekend away. The house is surrounded by wonderful countryside views and there is 1.5 acres for everyone to let off steam. Dogs are welcome too and there are some lovely walks directly from the property, one of which will lead you back to the village where there is a good pub and a fishing lake. This is house for all seasons and a welcome awaits at any time of the year.